John Coltrane: Thank God He’s a Country Boy! There is a something very curious taking place right now on the Billboard Magazine Country Music chart. I’m certain there is no Grammy Award or even a statistical category for this anomaly, such as Artist with the Most Records Sold, the Single with the Most Weeks at #1, or even sub-categories such as the Longest Song to Make the Chart. Nonetheless, let me briefly draw your attention to a strange confluence now on country radio: There are specific references to the late jazz saxophone master John Coltrane currently found within not one, but in the lyrics of two separate country hits this week! The jazz recordings of John Coltrane are about as far from country music as one can travel while still being on American soil. Briefly, Coltrane was born in 1926; he joined Miles Davis’ quintet in 1955; in 1960 he began his own solo career. Before his death in 1967, Coltrane was responsible for expanding not only the possibilities of the tenor saxophone, but of jazz itself. The first Coltrane sighting is found on the latest single by guitar virtuoso Brad Paisley, whose abilities could make Eric Clapton stop and listen. Paisley offers another of his up-tempo hot and clever country numbers on the song “Old Alabama.” It is sung from the point of view of a young man wooing his lady to the sounds of the band Alabama – a country group with its own very impressive chart statistics. The kicker here is that Paisley, in a continuing nod to his country music roots, has persuaded Alabama itself to come out of retirement to accompany him. “Forget about Sinatra or Coltrane / . . .
“Forget about Sinatra or Coltrane”? Frank Sinatra was, of course, the singer of choice for make-out artists of a previous generation. Barry White has similar appeal as the go-to guy for inducing romance. But John Coltrane? That’s a disconnect; a non sequitur. Why would this truck- driving Romeo even have Coltrane on his I-Pod? Just what sort of mood does the young man want to create? True, John Coltrane recorded many lovely ballads, but he is far better remembered for his lengthy, sometimes atonal exploratory improvisations which quickly leave any semblance of melody in the dust. Maybe the inclusion of the sax-man’s name is a hip, inside joke by songwriters Paisley, Randy Owen, Dave Turnbull, and Chris Dubois, especially since the word Coltrane doesn’t even rhyme with any other lyric line. Maybe the girlfriend in the song is a meth freak. But no matter the reason – a reference to John Coltrane appears in a current Billboard Country Chart entry! 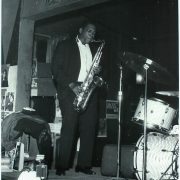 Unlike the one-time, passing reference in Paisley’s “Old Alabama,” the second example is even stranger as it links a young man’s positive attitude with a specific Coltrane composition. Uncle Kracker exudes extreme happiness during the sunny number “It’s Good To Be Me.” In the song’s culminating comparison, the singer’s euphoric attitude is equated with having “caught some Coltrane Love Supreme.” That’s odd. John Coltrane’s A Love Supreme is a 4-part cycle of compositions praising God. Released in 1964, it is a well known concept album in the jazz canon. The work was embraced as a religious touchstone in the mid-1970s by guitarists Carlos Santana and John McLaughlin, and more recently on separate recordings by both Wynton and Branford Marsalis. Primarily instrumental, the piece does have a hypnotic spoken repetition of the title words “A Love Supreme” during much of its opening section. Similar to the source itself, Uncle Kracker’s “It’s Good To Be Me” also repeats the phrase “Coltrane Love Supreme” numerous times. The reference only appears near the song’s conclusion, but becomes a shouted mantra of sorts as Kracker reaches his joyous finale. I suspect that songwriters Robert Ritchie, Brett James, Matthew Shafer, and Thomas Harding are purposefully mimicking the spoken chant in Coltrane’s original recording with the repetition found here. But why is it included at all? I don’t know. Other than this specific reference, “It’s Good To Be Me” has no religious overtones. It is a number glowing with life-affirming optimism but is completely secular. Its tone bears little resemblance to the extremely sincere gratitude shown towards God or the humility found at the center of the Coltrane work it sites. I’ll say it again-very odd. So, what can we learn from these unexpected examples of musical cross-genre references? From Brad Paisley’s “Old Alabama” we discover – and guys take note – you should not attempt to create a romantic mood for your girl with John Coltrane tunes. Simple advice, perhaps, but well worth the reminder. In “It’s Good to Be Me,” the words “Coltrane Love Supreme” become a late-song sing-along hook. It’s the part of the melody and lyrics which one remembers after the number is over. I maintain that if you can get a young Country Music fan to sing the words “Coltrane Love Supreme,” you are well on the way to planting seeds for one of the strangest musical pollinations imaginable. The true country devotee may one day wonder just who or what this Coltrane might be. And with just a cursory search, a new musical world could unfold. That is, if the listener doesn’t think that Uncle Kracker is singing about a Coal Train. This type of discovery flash point happened to me, albeit in a less jarring musical transition. In about 1985, when I was just getting over being a snob about current country, I was enjoying a live set by George Strait on Austin City Limits. After a handful of hits he introduced a song that he said meant a great deal to him, called “Lefty’s Gone.” It immediately stuck in my brain, but I had no idea who Lefty was and I didn’t worry much about it. However, after continually singing these heartfelt lyrics to myself for a few days, I thought that the man who inspired this tune might be worth finding. Early in the search I found Willie Nelson’s tribute LP, From Willie to Lefty, and some of Merle Haggard’s recordings of Frizzell songs. But Lefty himself remained elusive. When I finally tracked-down original recordings of Lefty Frizzell, I was transformed. I immediately realized why, in spite of only a handful of hits, his style had been so influential and important to country radio in the early 1950s. Hearing George Strait sing “Lefty’s Gone” that night ultimately resulted in my purchase of a 12 CD set of Mr. Frizzell’s complete works. Small seeds of interest can grow large. And perhaps this type of discovery is what will eventually occur with these two Coltrane citations. A few curious country fans may search-out the references found in songs they like and become devotees of John Coltrane. I hope it. And I doubt it. But apart from possible repercussions of influence, I still marvel at two different country music songs dropping Coltrane’s name into the lyrics. Even stranger, how could these songs share the same chart? This seems like it should be a once-in-a-generation songwriting fluke. And who in the country audience did these songwriters expect to connect with by using jazz references? I’d give worlds to know. I began by saying that Billboard Magazine had no category for such an anomaly, but I would like to suggest one for next year’s Grammy Awards – Most Pleasantly Unexpected Reference to a Musician from Another Genre in the Lyrics to a Hit Song. Hey, why not? We already have two entries vying for the award.